Two weekends ago, 48 street artists and graphic artists were given the opportunity to work with “motorized flipbooks” called FlipBooKits at a show in Brooklyn. Artists such as Luke Chueh, who designed the album artwork for Fall Out Boy’s album Folie à Deux, were featured in the show. Many of the artists have also created their own designer toys, such as Andrew Bell, who has collaborated with Google on a series of Android figurines. With a FlipBooKit, anyone can create a 24-frame, hand-cranked flip book. The project was begun by Mark Rosen and Wendy Marvel and was funded through the crowdfunding website Kickstarter. FlipBooKit raised more than $100,000 past its initial $5,000 goal. 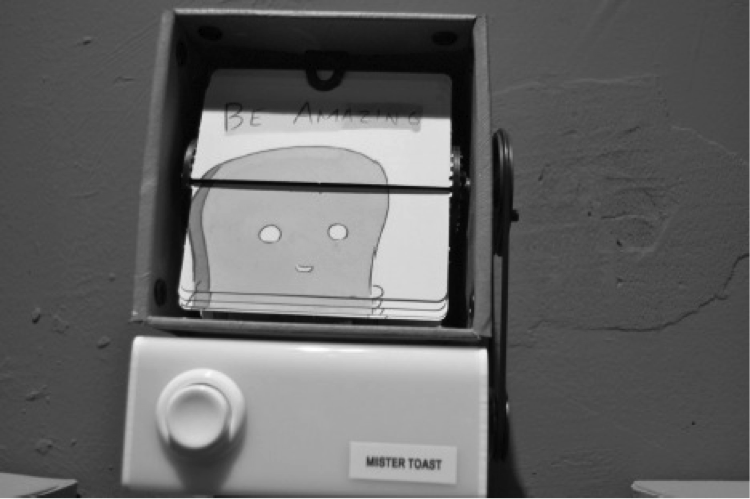 The FlipBooKit has been shown at the Bay Area 2012 Maker Faire, WIRED magazine, the Kinetica Art Fair in London, March 2013, and recently in Brooklyn at Grumpy Bert, an art gallery and store in Boerum Hill. When asked about the project, Marvel responded, “We love to support fellow creatives and help out this amazing artist community that’s forming around the kit.” Marvel had worked in the past with music artists such as Green Day and Rihanna due to her company Slenderfungus, which Marvel says “creates digital content for music artists.” Wendy got the idea of the project after her observations of “a retrospective of Edweard Muybridge at the Tate in London in November 2010.” After Marvel talked with Rosen they both wondered if they could create a more compact and more accessible version of a Mutoscope, a hand cranked machine that used a central rotating cylinder with images aligned on the pages. One of the artists, Brandon Sines, who recently had his work featured on the television show Project Runway, is well-known for his work on the street with his character Frank. Sines said he felt the project gave him many advantages. Sines said, “For me it’s all about bringing Frank to life in newer and bigger ways… So the flip book concept worked perfectly…And having it in a continuous loop makes it feel more fluid and like a cohesive piece.” Sines’ flipbook featured his character Frank infinitely unzipping himself, always leading to another Frank. In shows like these it is very interesting to see how artists deal with the same project despite coming from different perspectives of art, whether it may be coming from someone with a toymaking background or someone who puts up posters with wheat paste throughout the city. Getting your favorite street artists sketch in your blackbook, getting to know them, and then following them in their journey as an artist can be very stimulating for fans and has been creating street art communities around the world. Bert, the owner of Grumpy Bert, said he enjoyed this group event a lot due to the fact that it was focused on one theme. “Group shows are always fun. It’s interesting to set up a theme (in this case the FlipBooKit) and see what each artist comes up with.” Bert has made a FlipBooKit himself. Bert’s FlipBooKit shows himself transforming into his lovely pug Remy in only 24 frames. Bert also said he was very happy to see how interactive the show had been. “Watching people interact with the pieces is the best. This show is definitely a fun one and [I] hope that people can experience it before it’s over, Dec. 28th.” Many of the pieces in the show can be bought via the website, but people who are not up for buying should take advantage of visiting the store and look at the pieces themselves.